Only a few years ago I discovered a love for cake making and cake decorating. I have been on a mission since to learn as much as possible and become an expert! Cake decorating is not as daunting as it can seem and with a few tips and tricks, you can make impressive cakes that will make you look like a professional! One day I had a sudden desire to make a cake. I had visitors coming over soon but alas – there was no cake mix packet in the cupboard. So I would either have to go without cake or make one the ‘hard’ way. I decided to give it a go! That was when I found the perfect vanilla buttercake recipe. It was easy, fast and soooo delicious! Then I was hooked. I made that same recipe several times over the next few weeks – for 2 birthdays, unexpected visitors, tried it in the form of cupcakes, all different sizes of tins and the chocolate version. In book that I found that first recipe, I was intrigued by the smooth formal fondant icing cakes that looked so much more professional and wondered how I could make one that looked like that. 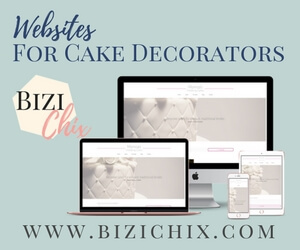 I did some surfing on the net and came across a website of a cake decorating shop close to home. I’d already seen their website before and decided that I should go there to see what they sell and the rest is history…! My first mission was to make my son’s Christening Cake as professional looking as possible. I set myself goals and made several practice cakes beforehand. Before long, I was a pro! My goal now is to spread the word about how much fun cake decorating is while showing that it does not have to be as difficult as everyone makes out. I’ll be adding more and more info, tutorials and book & product reviews as time goes by. Watch out for my blog posts from time to time too, where I’ll detail my most recent cake decorating challenges and discoveries. If you have any questions or comments I’d love to hear them! The best way to contact me is to sign up for my FREE eBook and simply reply to any email I send. Sign up to receive my FREE eBook and you’ll discover some of the hard to find tricks of the trade that’ll get you on the path to awesome cake decorating. You’ll also be notified as soon as there are tutorials or new tips & tricks to learn.